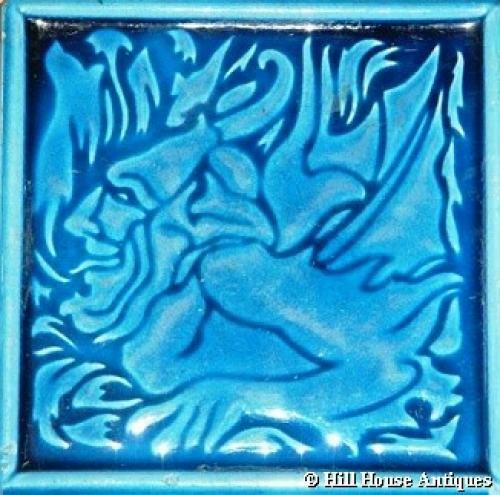 A turquoise blue glazed 6 tile/teapot stand designed by CFA Voysey of a demon portrait (in reality a caricature self portrait) and manufactured by JC Edwards of Ruabon, North Wales, c1900. Voysey utilised this demon/devil caricature also as bookends, stone carved architectural pieces and his Demon wallpaper. Also compare with the standard lamp we have with similar devilish piercings. For reference see: Fired Earth 1000 Years of Tiles in Europe published by Richard Dennis, page 129. An example exist in the Ironbridge Gorge Museum collection.